I will be having a full breakfast at Newgale, but that won’t be for another two hours and I remember that there is a last satsuma in the cupboard. When in B&Bs I try to have grapefruit or whatever fruit is available if possible; sometimes there are just cereals in which case I sometimes opt for the childhood delights of Frosties, although never yet have they had the ultimate cereal, sugar Ricicles. These are still for sale, although I don’t think the ‘S’ word would appear in any advertising nowadays, maybe ‘frosted’ or even ‘coated in non-sugar sweetener’ for the more ersatz versions. Somehow cocoa took over from sugar coating in the cereal of choice for children; I doubt whether this is due to children’s own recognition of the dangers of infantile obesity, so maybe a gradual shift in the gene pool, or the effects of climate change on the childhood brain. Well, climate change has clearly not affected my brain, and, despite losing my sweet tooth in the mid-1990s, I still enjoy the odd bowl of Frosties or even (shh, don’t tell the dentist) the odd sprinkle of sugar on Rice Krispies … and don’t get me started on marmalade. Or maybe I just never grew up? "Can I have the full breakfast, but have the egg as boiled egg with soldiers?" She did a slight double take, "you want the full breakfast *and* the boiled egg with soldiers"? "Yes, but instead of the egg in the breakfast. Is that OK?" "It is like I had when I was little," I explain. This seems to satisfy her, and she goes away only to return a little while later. "Do you want toast or bread soldiers?" she asks. I experience a moment of confusion, as I normally don’t have untoasted bread at breakfast, but then remember it is for boiled egg. "Um, oh yes, bread; it’s got to be brum-butter for soldiers." "Definitely," she says, "it is only right." I wonder if she is just humouring me, but it is with clear pleasure, albeit a hint of amusement, that she brings me my egg with soldiers. 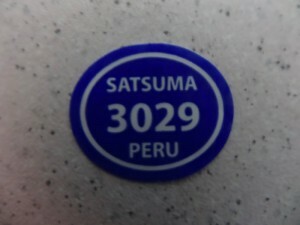 I am prompted to think about the satsuma, rather than simply eat it, because I notice the label, ‘Satsuma 3029 Peru’. What happened to the other 3028 satsumas from Peru, I wondered. 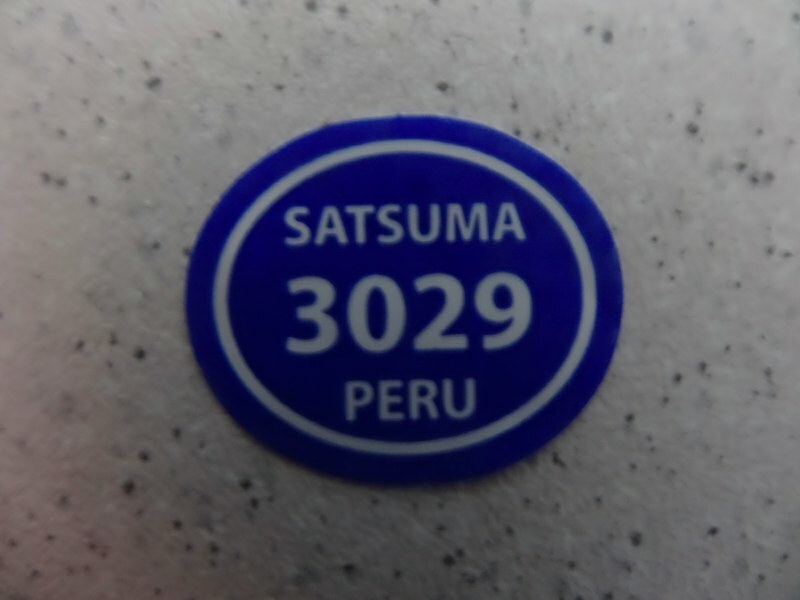 Did the satsumas I had eaten on previous days say, ‘Satsuma 3027 Peru’, ‘Satsuma 3028 Peru’? The satsuma comes from the St Davids Nisa, and it is a satsuma the dimensions of which I have never previously encountered; instead of the usual diminutive billiard-ball-sized fruit, it is a positive cricket ball of juice. Nisa is the ‘big’ supermarket in St Davids and as well as giant satsumas has one of the best hot cross buns I have tasted. This was not your luxury, all the finest ingredients type, but the standard, we’ll sell at any time of the year not just Easter, for the undiscerning who don’t know about fruits in season, sort of hot cross bun. Just so you know, I am not usually the ‘undiscerning who don’t know about fruits in season’ person; I wouldn’t normally buy hot cross buns at this time of year, but, well (1) they did look good, and (2) I am on a long walk and need to keep my energy up, and (3) I am in St Davids, a cathedral city, so it is sort of Easter-ish. There, my reputation saved. 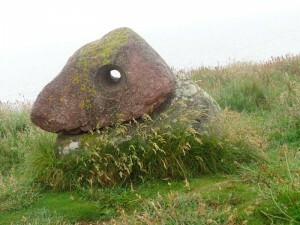 It was this very Nisa which I visited about a year ago, in the early days of thinking about the walk. I recall going in and trying to pay by credit card. It repeatedly failed, not my card, but the machines. "Oh, the machines are new this week, they use the internet now instead of the phone, but the internet keeps going down." 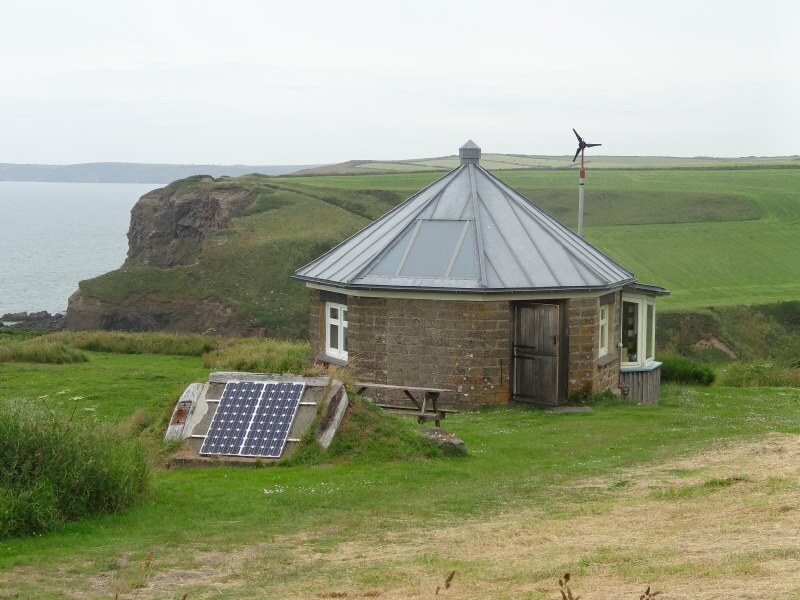 I got my first indication that rural connectivity in West Wales, even in a relative hub like St Davids, was not going to be any better than back in Tiree. And then I have to rush for the bus as I realise I’ve been spending the morning writing about satsumas and bread-and-butter soldiers. While waiting at the bus stop I can see preparations for market day in St Davids. Another bus arrives and as I ask the driver to double-check I am waiting in the right place, a gentleman gets out dressed in green tweeds and carrying a sack barrow. As I turn to go back to wait I half see him get back on, and then a moment later see why. He obviously went back to retrieve three basketwork hampers, which he piled on the sack barrow before heading down towards the market. I couldn’t follow to see, but I feel he must be about to set up an antique stall, or maybe a bookstall. On the bus to Newgale I talk to Fay, who has lived in St Davids for more than twenty years. 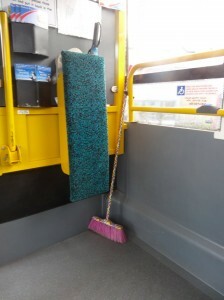 We initially start talking because of a glorious multicoloured sweeping brush strapped to a bar in the bus. I assume it’s there to sweep away sand, but Fay tells me of a time when a farmer got on the bus with a hay bale, which the children on the bus sat on for the rest of the journey. This leads on to exchanging stories about health and safety regulations and other bureaucracy that makes so little sense in the rural environment and for which the relevant planning and enforcement officers have little if any room to apply discretion, or plain common sense. She also tells me about problems for locals, with housing prices driving locals inland so that the coast is incomers-only territory. Employment is also a problem. In the past, there were busy summers but fallow winters. However, now even the summer season is slowing. With employment tight, there are growing numbers of people trying to make businesses in a shrinking market. Fay is a complementary therapist, but there are more people being trained in this, setting up businesses and competing. She needs to work doing Saturday ‘changeovers’ to make ends meet. Her partner, Chris Tancock, was one of the first photographers in the area, who managed, against some resistance, to get photography recognised as respectable art in local galleries. He also runs photography courses. Now some of the people he taught, and others coming into the area, are selling to the same galleries, undercutting. I have visited the Sands Café in Newgale before. It was the same visit last year when I was at Nisa. I had just stayed with Alan Chamberlain in Aberystwyth, and came down to St Davids for a night before meeting Parisa in Swansea the next day. It was that time I found the Glan-y-Mor campsite where I have been staying for the past few days. Glan-y-Mor appears to be the closest campsite to the centre of St Davids, just a quarter of a mile down the road from the Oriel y Parc, but doesn’t seem to be listed anywhere. Maybe it is new or maybe too ‘basic’, certainly few frills, but clean and quite cheap, especially travelling alone as it is priced per person. Some of my days using B&Bs have been quite expensive, so cheaper camping days are very welcome. It is not just the price of the night, but most B&Bs do not allow takeaways, so you end up eating out. I should note that full breakfast in a café does not count as ‘eating out’; it is bare necessity … albeit mixed with hedony. I recall I originally intended to eat breakfast at Solva, but it was the day of the sea rowing competition, so, worried that I would get boxed in in the car park, I moved on and instead ate at The Sands. As I sat I overheard snatches of a conversation at the next table, which mainly consisted of who had been put away for GBH, and rivalry with another family that inevitably ended with someone getting a boot in the head. The Celtic nations have always had a problem with internal division, one of the reasons why first the Romans and later the Saxons and Normans could invade. Even today there is a lot of distrust between North and South, let alone the borderlands.Celtic legends are full of rivalries that inevitably end up not with someone getting simply booted, but normally speared or axed to boot. So maybe the next table were simply part of an ancient tradition. Today there is no sign of GBH, simply a sign across the road proclaiming, ‘This is a HomeWatch Area‘. The word ‘Area’ is randomly underlined. 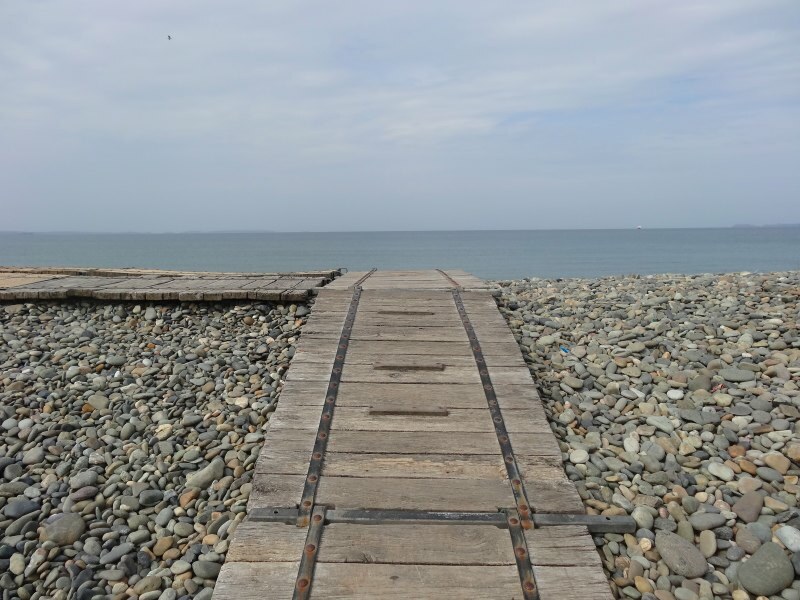 Unfortunately the tide is high, so I cannot walk along the sands at Newgale, but make fast progress along the roadside behind the beach. At the far end of the beach is Pebbles Café, which had confused me when I’d seen the bus timetables, as it came before the Duke of Edinburgh and I’d not realised there were two cafés. Then beyond Pebbles the route rises once more onto sea cliffs. The rock clearly has soft patches around here as the cliffs are frequently cut by small valleys with the path dropping steeply down one side and then climbing equally steeply up the other. 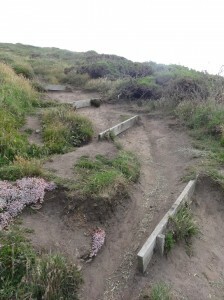 The steeper portions have been improved by the addition of wooden steps, but evidently some years ago, as the earth behind them has often eroded away, making them more like hurdles. Another sign of the soft rock, an ice-deposited conglomerate that lies over harder rocks, is that areas of the cliff edge have ‘dropped’. One huge area, a semicircle a hundred yards in diameter, lies a full twenty feet below the level of the cliff, with torn raw earth edges all around. It has obviously slipped recently as the earthy tear has not greened over, but there’s no way to tell whether it moved gradually or in one cataclysmic slide. Further on a smaller semicircle is cut from the cliff face, this time a mere ten yards diameter, but somehow more worrying. 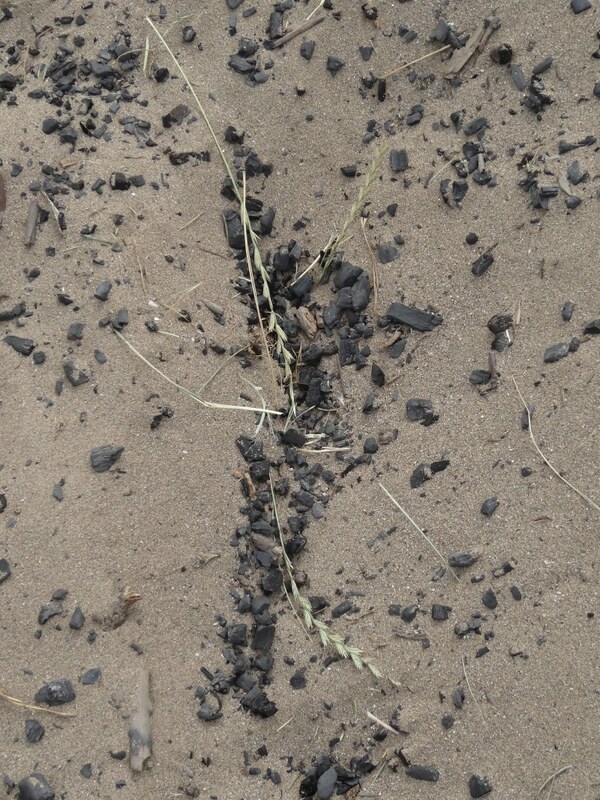 The larger bite is so cataclysmic one cannot plan for it, like a meteorite strike, an act of God, but the smaller bite is more the scale of the path itself: you stand on the path, a full six feet from the edge, still the ground may slide away beneath you. 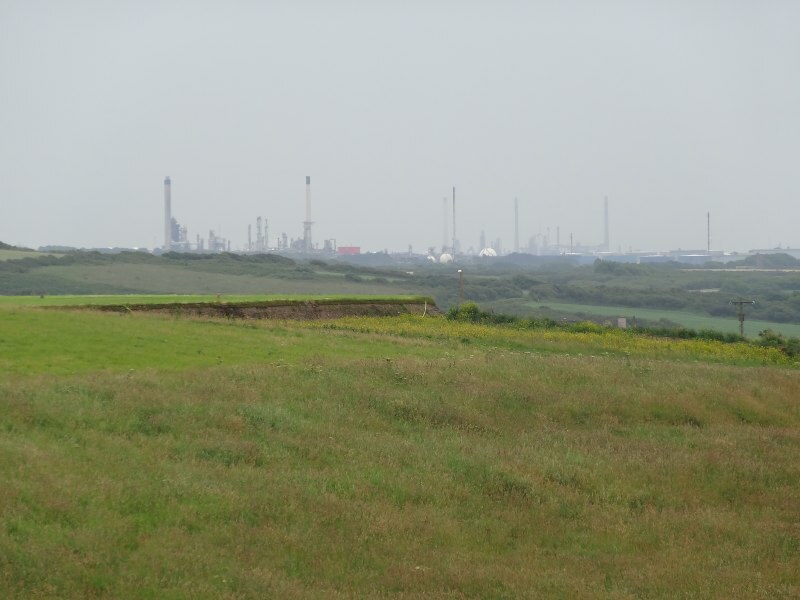 Not far from the end of Newgale Beach is a small valley with a chimney in it, the remains of the coalmines that shaped the landscape. I wonder about the valley itself, the flow of water down a little stream seems hardly sufficient to form it, so perhaps it was excavated in search of the black gold. Coming into Nolton Haven I meet a man who was on the bus that morning. Given I’d stopped some time to talk on the phone, I’d guess he’d taken the bus on to Broad Haven and walked from there. It turned out that he was an experienced walker and had walked the complete Pembrokeshire Coast Path three times, including the bits around Milford Haven that most people miss: "they skip it and go on to Angle", he says. 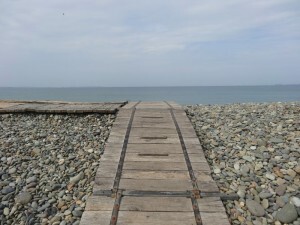 Nolton Haven itself has a small beach, the Mariners Arms (families welcome; groups and coach parties by arrangement) and a small United Reformed chapel. The chapel is closed and doesn’t look so different from the very many chapels I saw along the North Wales coast, except it is still a chapel. However, looks belie, and on the notice board is an article by Chris Coe, the ‘rural officer’ for the URC in Wales; it tells of his first visit here one Easter, the church that was empty at 29 minutes past the hour, for a half past service, but in that last minute filled to bursting point and was filled with a deep sense of fellowship and worship. Given he must see a lot of churches, this was an impressive account and made me want to visit here sometime at 9:30 on a Sunday morning. 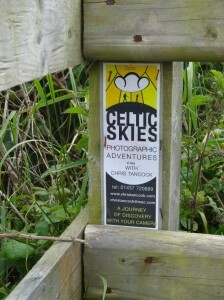 Coming up the path, on a stile I see a small plastic-covered notice advertising photography courses by Chris Tancock! A little further from Nolton Haven is Druidston. Turning into the valley, with its beach below, the first sight is a building, which turns out to be the Druidstone Villa café, restaurant and hotel, and also something slightly space-age built into the hillside, a sort of hobbit house with green panels and portholes, which turns out to be an eco-house, one of two eco-houses in the area. I am about to pass a couple with their dog coming up the path when the man says, "it’s Alan, isn’t it?". 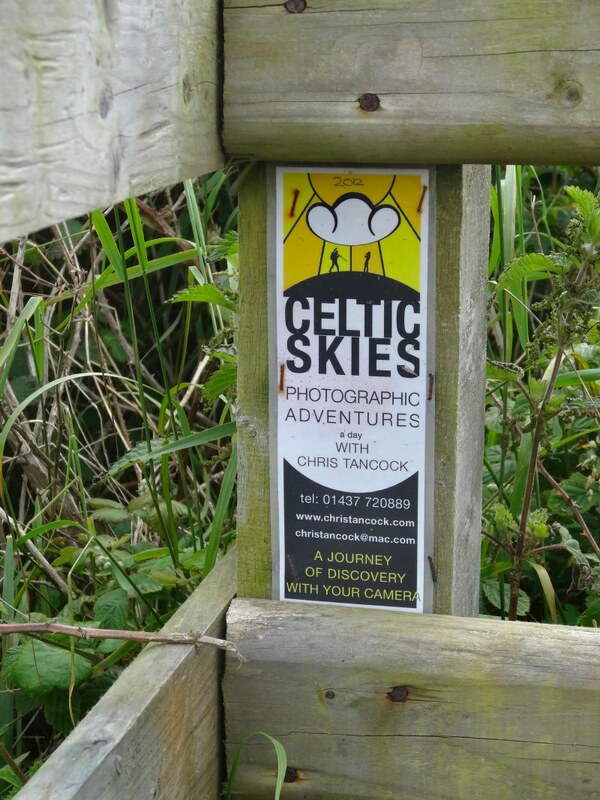 It is Steve who walked with me the first miles of the Coast Path at Chester. 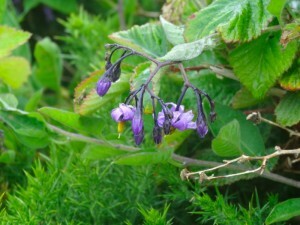 He and his partner are staying at Nolton Haven for a few days before he starts to teach an intensive summer course. They tell me that I should visit the Druidstone even if for just a cup of tea. So I do, and it is a wonderful place, a combination of deep armchairs in the sitting rooms that could have been there since it was built (maybe they have) and bright wall hangings and paintings that feel more beach hut. It is also a good break while the sky decides whether the drops are going to turn into proper rain or pass away. I have tea and Welsh cakes in the bar; not like my Mum‘s Welsh cakes, but that is another story. Becky is serving at the bar and is interested in the walk; she tells me about the hotel and the way Andy (I think that is the name), the owner, is trying to make it eco-friendly, with a wood chip stove and other measures. This is hard to do on an existing house, but attached to the house is the other eco-house in the valley, a small octagonal hut that has its own power and reed bed soakaway. Washing is in a tin bath served by the solar heating. I leave my phone number as well as a few leaflets, it would be good to meet Andy on my reprise journey. Coming over the cliff path I meet two runners; this part is easier going than for the runner I met at Newgale yesterday, first going down the cliff path and then a few moments later back up it again. 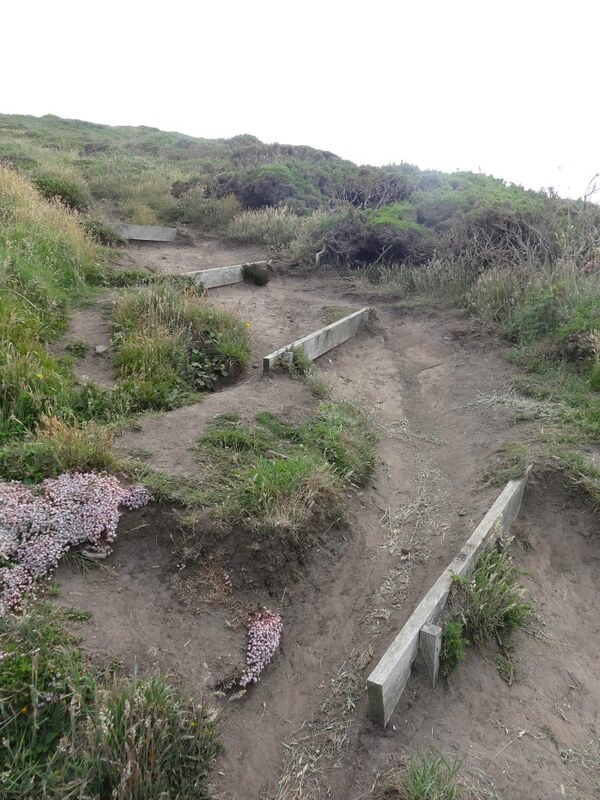 Indeed, it becomes easier still when a tarmaced path comes down from the road and passes along the clifftop for a while before ending at a viewing point. A couple of cyclists have ridden down off the road to enjoy sea views with sandwiches. A while later I catch my first glimpse of Broad Haven beach, with something that looks like either arranged stones, a veritable Avebury of the sea, or maybe a crowd of people. And I also catch my first glimpse of Milford Haven. 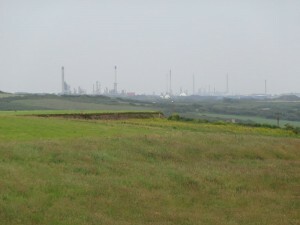 In fact from the campsite you can just make out two towers in the distance, but only because I first saw the lights at night, but here the whole oil terminal rises, ethereal in the hazy air, as if it were from a different world, towers and domes rising beyond, or above, the fields and cliffs. It reminded me of the story in the Mabinogion when the protagonists, out riding, suddenly find all signs of human habitation gone, just hill, stream and mountain top. The landscape the same, but the trappings of civilisation all vanished. For a year and a day they seek for the land they knew, but while they do they make the most of this bare, but not barren land. It is only when they capture a pregnant mouse who was stealing their corn, the transformed wife of the magician who had bewitched them for an earlier slight (the Celtic curse), that all is restored. I always say you can tell a land by its fairies: Scottish folk tales are dark, with selkies and creatures poised to pull you down in every pool or marsh; in Ireland they are troublesome, but more naughty, revelling in trickery and mischief; the English fairy is solid and earthy, the mill boggart clogging up machinery; but in Wales it seems the veil between fairy and solid land is thin, the fair folk’s world superimposed, often glimpsed briefly through the corner of your eye, but never there when stared at in full view. It turns out that Avebury of the sea is in fact a party of schoolchildren digging tunnels, building castles and scraping messages and hearts in the sand. I’m sure the official school reports talk about the educational aims and outcomes, the learning objectives and key skills gained, as it would be unacceptable just to play. I pop into the supermarket to ask about cafés in Little Haven; it seemed a little awkward to do so in the Broad Haven cafés. "Yes, there is a cafcafé and three pubs," I am told, "it is a lovely place to spend some time." So I press on to Little Haven, as its name suggests a smaller beach than Broad Haven, with a small harbour. I go to Ceri’s Café, but there is no food until six. Happily there are sausage rolls, so I have that for my lunch. The café has pictures of New York and I wonder if this is intended to give it a ‘diner’ feel, but Ceri says she simply puts up the pictures she likes. As well as the New York theme, there are numerous paintings of horses. Each year she buys a horse painting from a different local artist, most of them painting as a spare time activity amongst other jobs. One is from a professional, Shirley Norman, who has a gallery up the road; she normally paints seascapes, but painted a horse (riding through sea) especially for Ceri. I was amazed at the quality of the pictures, and more so given the majority came from local artists. 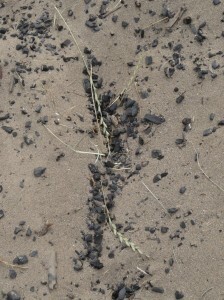 I especially liked an image simply of hooves with sand/earth flying beneath them. As we talk, Ian, the husband of the seascape artist, comes in, and we begin to discuss the season so far. Ceri says the trade has been slow in recent years, but doubly so this year, recession/austerity cutting yet more deeply. This has been a recurrent, but not unexpected, story along the way, even though we are being told things are looking up in the economy. It seems the only part of the economy heading up is London house prices. I briefly pop up the road to look at the Norman gallery. As well as her own seascape paintings there is a variety of work by other local artists, but it was the colour in a corner that caught my eye. At first I thought I was seeing pottery with metallic glaze, but then I realised it was turned wooden bowls and pots. They have been cut from the wood edge, leaving rough edges where the bark has been, and in places jagged holes. But this turning in the rough is not unusual. It is the colours: iridescent rainbow dyes, creating shifting patterns moving across the grain. It is the work of Kim Gowney, and Shirley tells me she has only had it in a few days ago, a week earlier and I would have missed it. I at first referred to Kim Gowney as ‘she’, since I’ve always known female ‘Kims’. Shirley corrects me, Kim is a man, like Kim in The Jungle Book. While on gender, I realise that I don’t think I’ve ever come across a female wood turner. While crafts often have biases, for example there are more female textile artists, I usually know exceptions, but not for woodturning; maybe you know one? As I look out from the gallery, the sky has eventually found the strength to rain properly. Not the torrential, hose pipe from on high, bouncing off the ground kind, but more the bathroom shower, persistent kind. But I’m too late to chicken out and get the midday bus back, so I head on to St Brides. A path that leads through a rare wooded section of cliffside, welcome during the heaviest rain, a mixture of birch, beech and, I think, sycamore. Out in the bay there are ships, waiting I assume to go in to Milford Haven, but avoiding the costs of spending extra time there. At night from the campsite their lights shine, Christmas-like, across the waters, but on this side of the bay, closer, I can sometimes hear their sea-softened machinery hum. As the rain slackens the slugs come out, black, leech-like, covering the ground so I have to watch each step to avoid committing slugicide. 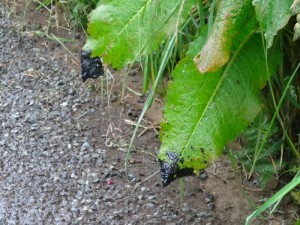 Although, I wonder, am I as worried about dead slugs as messy feet? It is interesting how pretty kitten pictures abound on the Internet, but not slug lovers; and as I write I realise I too did not photograph a single slithering slug. The approach to St Brides Haven is heralded by the appearance of St Brides Castle dating back to the nineteenth century, and now a timeshare. It looks every inch an expression of Victorian control and tidiness. As if to challenge this, the rocks of St Brides Haven have an almost volcanic, slag-like appearance, blistered and rough topped, covered with phosphorescent green and cadaverous white algae. I ask where the bus stops, and find you have to go up the road slightly from the beach car park. Well, strictly it stops ‘anywhere’, you can just hail it down, but of course anywhere means along its route. Although it is ‘obvious’ what route it will take between things on the map, it is reassuring when I get to the road and find a bus timetable. I have nearly half an hour to wait, so I shelter near the entrance to the castle and find I can type pretty well one-handed on an iPad while standing under a dripping tree. On the bus back is a lady, Sindy, whom I’ve met several times on the bus and then as we pass the Druidstone, Becky gets on. She tells me a bit about her own story, reinforcing the tales of struggling businesses and difficulties with employment across Wales. She used to work at the Sounds Café, which, like the beach café in Goodwick, was working on a principle of good value food using best quality ingredients. This would seem like a winning formula, but in difficult times it is now closed with a sign looking for new management. Happily, at just the time it was closing she found the job at Druidstone, where the proprietor takes the same care over his staff as he does over the internal decor and its external impact on the environment. So she is very happy, but tells me how fortunate this is, given the difficulties of finding employment, especially out of season. Thanks for your kind comments about the Boathouse Gallery! Good luck and hope to see you again soon.